With mounting regulatory expansion and dramatic increase in fines and settlements, financial institutions may easily face the risk of bankruptcy. To avoid this, they need to embrace new approaches to handling of governance, regulatory, and compliance costs. RegTech no longer seems an unnecessarily costly investment, once you consider the numbers. The primary cause for the post-recession regulatory expansion was the financial crisis of 2007-2008. Responding to the collapse of multiple investment banks, massive bailouts of financial institutions, and the global economic downturn caused by the excessive investment risk-taking and subprime mortgage, the US and EU regulatory bodies implemented numerous laws to prevent the collapse of the world economic system. In eight short years, between 2008 and 2015, the number of regulations within the financial industry increased by 492% and went from 8,704 to 51,560. According to FCA estimates, by 2020 the volume of regulatory documentation will exceed 300 million pages. In 2016 alone the number of regulatory alerts reached 52,206 with 201 daily alerts on average. Each one of the new laws would be demanding enough, but their combined impact is staggering. For instance, the Dodd-Frank was just under 2,500 pages long when it was passed in 2010, but its current version is over 23,000 pages. While only 50% of the law’s requirements have been implemented, less than a third of businesses consider themselves ready to face the music. More regulations are under development. It’s no wonder 79% of the CEOs name over-regulation among the top threats to their business’ growth. Fourth year in a row, the summary of the 19th Annual Global CEO Survey emphasizes regulatory concerns, and with a good reason. The expansion of laws and regulations after the financial crisis of 2008 turned the number of lawsuits into a landslide that came close to decimating American and European financial markets. Astronomical fines and settlements killed many businesses, but the largest financial institutions stayed afloat and adapted to a new financial world order. According to McKinsey, between 2009 and 2014, the amounts paid by financial institutions multiplied by x45. Financial Times research estimates the post-2008 crisis regulatory fines to reach $300 billion. The analysts at George Mason University’s Mercatus Center are less optimistic and have calculated the total financial cost of the post-recession regulatory expansion (between 2008 and 2012) to be $518 billion. These numbers don’t seem so far-fetched if you consider the largest fines paid by international banks to the US regulators between 2009 and 2014. 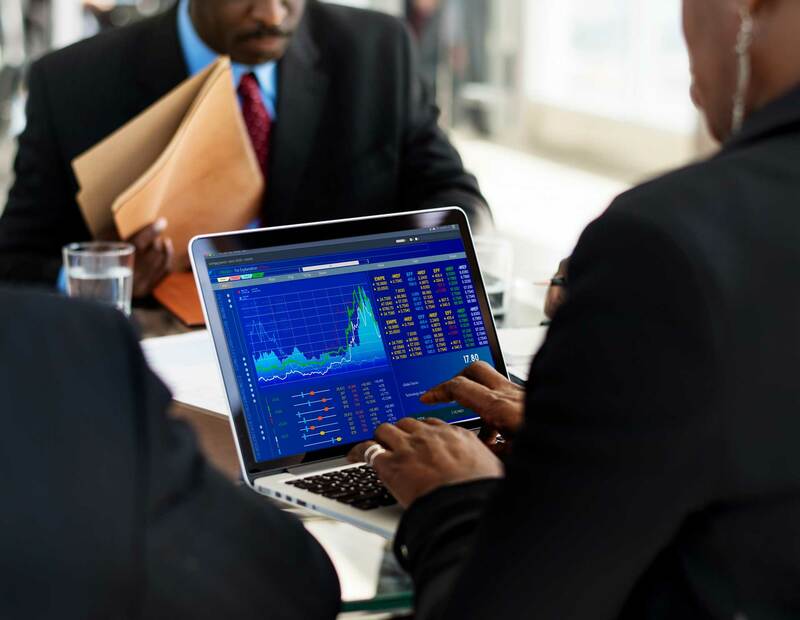 To avoid the devastating regulatory settlements and fines, financial institutions are willing to invest in Governance, Regulation, and Compliance (GRC). The expenses include workforce, software, hardware, and more. Considering the regulatory expansion, the GRC costs will continue to increase. Bain Consulting analysts estimate up to 20% international banks’ operational expenses to be devoted to GRC. Moreover, almost half of the budgets aimed at operational transformation are related to compliance issues. On average, the Top 6 world’s banks spend $70 billion a year on GRC, when in 2014 this sum did not exceed $5 billion. The expenses are expected to grow at a rate of 10% per year. According to BBVA, up to 15% of the total workforce is dedicated to GRC. JPMorgan Chase added 13,000 employees to handle GRC between 2012 and 2014 at a cost of $2 billion. 71% of the companies expect the increasing costs of compliance professionals and factor the additional expenses in their budgets. Supporting these trends, a recent Let’s Talk Payments report predicts the GRC software expenses to reach $118.7 billion by 2020. Third-party business and consulting services are expected to make up 55% of the sum. With 750+ global regulatory bodies and 2,500 compliance rule books, only 17% of the financial institutions have implemented RegTech. While giants like JPMorgan Chase, UBS, and Deutsche Bank have been heavily investing in compliance professionals and technology to avoid reputational and financial risks, smaller businesses are lagging behind. Without prompt RegTech adoption to avoid fatal fines, they face significant losses or bankruptcy. 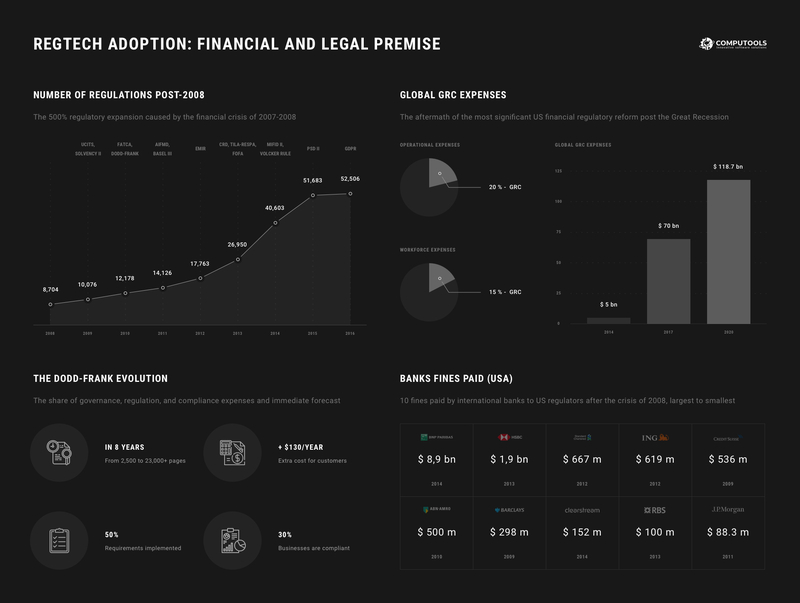 Considering the current advances in artificial intelligence, blockchain, and cloud technologies, RegTech solutions are no longer out of reach of small and medium-sized financial institutions.